It's the first of the month. 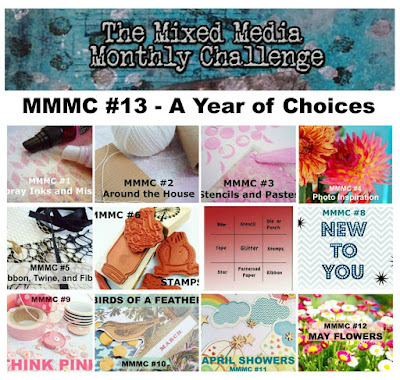 That means it's time for another challenge over at The Mixed Media Monthly Challenge. We are celebrating our 1st Birthday!! It's been an awesome year and we have lots of fun things planned for our birthday celebration. Be sure to check out this month's challenge post for some amazing inspiration. We are also implementing a few changes to our challenge rules, so be sure to remember the following when creating your June post. 1. You must include the challenge graphic. 2. 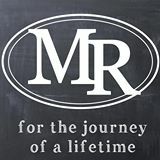 You must comment on at least 3 design team member's blogs to be eligible for prizes and recognitions. 3. You may combine with 4 other challenges. Also, our sponsor this month is Maya Road and they are offering 2 prizes filled with Maya Road Goodness to our 2 lucky random winners. Our theme this month is "A Year of Choices." You can pick out any theme we have done over the past year. How fun is that? For my project I used several themes: Spray Inks, Around the House, Stamps and Flowers. I made a very Patriotic American Shadowbox. Since Memorial Day was last week and the 4th of July is coming up and I bought an awesome new Unity Stamp Company Patriotic Stamp set, I was in the mood to make some thing red, white and blue. Michaels has had these 7 Gypsies Shadowboxed in the Clearance section a while now and I finally picked one up. 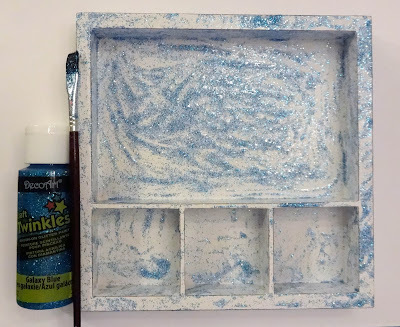 To create the background I brushed on some Decorate Twinkles Glitter Paint in Blue Galaxy. Then I sprayed on Decoart Spray Ink in Primary Cyan and Maya Road Spray Mist in Strawberry. When I was trying to decide what to do, I thought my big Unity Flag Stamp would fit perfectly in the big opening - and it did!! I also used the smaller round star with stripes Unity stamp. I used Decorate Media Matte Medium to adhere the stamped images to a piece of thick chipboard before I adhered them to the box. I stamped Let Freedom Ring on a Maya Road Ticket and stenciled a red star on the ticket with Decoart paint and an Andy Skinner Stencil. I attached it to the shadowbox with a Maya Road Mini Clothespin in White. In the lower left corner of the box I added a Maya Road Kraft Flower that I colored with Stampers Big Brush pens in red and blue. Then I added a wood 4 and 3 blue Maya Road flowers. For the rest of the embellishments I used stickers from various companies. Thanks for stopping by and I hope you will play with us this month!! What a cool project Donna. Your shadowbox is gorgeous - I love it. My husband was in the Army 24 years and so the red, white & blue is most precious. So so so glad you 'finally' picked up the shadow box Donna. It's FABULOUS. It just makes me happy - everything good and right and wonderful about the red, white and blue. It's so up beat and happy... really special. j. Your creativeness in combining several themes works in your project. Nicely done. Fabulous shadow box. 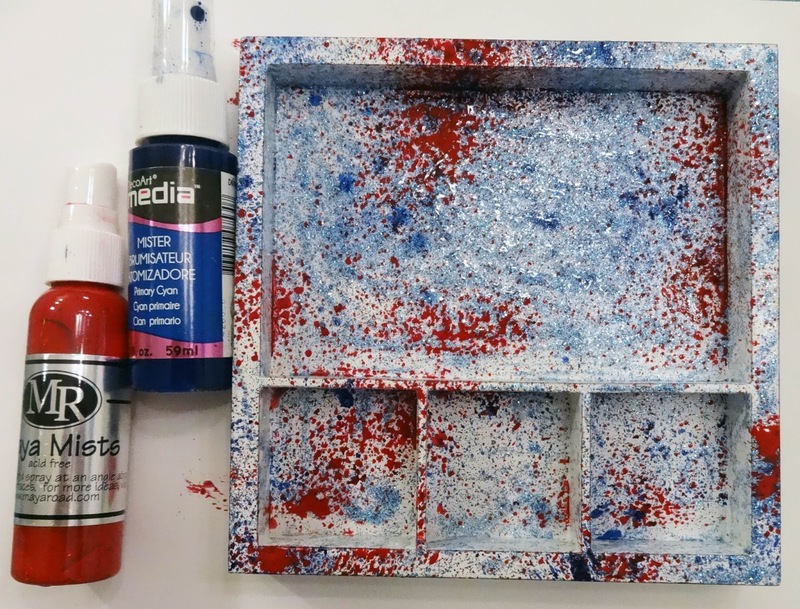 Red, blue and white look awesome on your project. 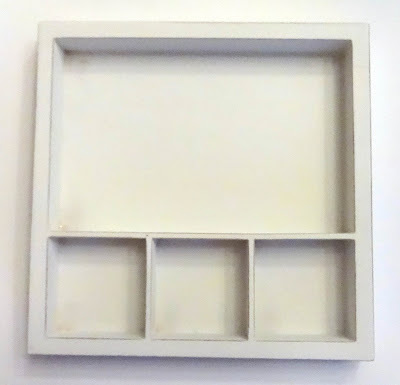 I've always wanted to make a shadow box & you have so inspired me, Donna! All your details are wonderful--such a great home decor piece! Wow... what a wonderful piece to decorate for the 4th of July.... Love the shadow box splatters. This will look perfect in your home for the holiday ! Wow, what a pretty shadowbox! Love how you painted this box - a wonderful 4th of July decoration! Love this project- so patriotic and fun!! What a great idea! I love this project!! 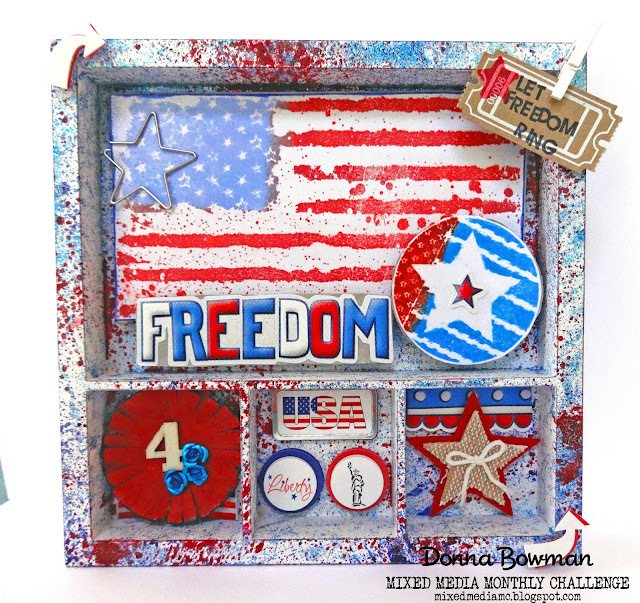 Wonderful patriotic shadow box Donna, how wonderful the Big Unity flag stamp fit into the shadow box so perfectly! Fabuloso!! !, me encanta!! !...los colores, la composición...es increíble ! !, muchas gracias por el tutorial!! Totally fun commemorative piece for Independence Day, which is the same day as my wedding anniversary, too. I like that each section is unique but acts as a covalent bond to/woth the other components to maintain the theme. Cute embellishments, too.! Such a fantastic patriotic project! Love the vintage vibe! Thanks for the inspiration! Fantastic project Donna !! love the red, blue and white !! Beautiful 4th of July project! Love the colors! A fabulous Patriotic Project Donna. Love how you've painted the box and the red whiten blue theme you've kept running throughout . I absolutely love this. I've never made a shadowbox but you've done such a fabulous job, it makes me really want to try it!